While located in Supetar, Hrvoje Baković is tough to find because he doesn’t have a proper tasting room and unfortunately the listing for his business is his home address. He’s quite a character who worked for many years as a sailor in New Zealand to save some money, before returning back to his homeland to start his own winery. Once there, he bought five hectares of land and worked to build up his winery. He started at something of a disadvantage because while his family has a history of growing grapes, they didn’t have a history of making wine. None of this has held back Hrvoje and he has learned a great deal about the climate of Brač in a short time. He knows what grapes work and what don’t. He is one of the few wine makers who has tried other grapes only to fall back on Plavac Mali because the grapes can handle the climate the best. Either somewhere in his travels or perhaps it was just in his blood, he was able to start making one hell of a Plavac Mali. It’s so good that even staunch Croatian wine critics are taking notice of this small wine maker who only produces 12,000 bottles of the wine a year. His vines are on the south side of the island, by the village of Murvica, getting regular sun, making for a lot of light on the grapes in a similar fashion to the Dingač region on Pelješac. Not to sit back on his laurels, Hrvoje planted Cabernet Sauvignon vines as well and began bottling them a little while ago. He even made some tentative steps in to the Crljenak Kaštelanski world and planted 50 vines as a trial. This experiment quickly proved why Plavac Mali has caught on in the region so well because Crljenak is tricky to grow on Brač. He says that everything seems to be going fine, you go home from the vines one day and then find the fruit shriveled up and unusable the next day. It appears that the Plavac is a lot more forgiving to Croatian summers. If you are in the region and get a the chance to buy it his Plavac Mali, do so. We covered it in great depth previously with tasting notes. We talk a great deal more about the wineries of Brač Island as well as the other Croatian wine regions in our Dalmatian enotourism guide. Mr Bakovic and his parents are making exellent wines. The Plavac Mali his naming Murvica is an exeptional good quality. The vintage 2005 was so fare the best yet. It could in some way compareing with the Plavac from Dingac, but in my opinion Bakovics wines are more stylich and complex. It dont show to much of sweet boldness. Its thinner but still dark, dark colored. It feel like it has grown in a bit colder enviroment. But beeing there some times in both May and September, it feel actually just like the Dingac slopes. But more windy. I love to come down next mounth to taste the 2008 vintage. And hope to try some of his Cabs too. Just to be fare. 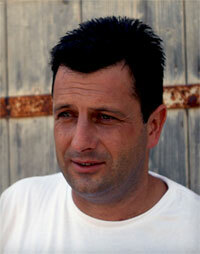 There are at least one more winegrower who produce quite good wines too on the Brac Iland. I think they named it Dragons Cave. But Bakovic aims a class higher. Try him out. There are definitely three if not four more actual cellars on Brač. Along with Baković we visited two others in 2007. One of them PZ Bol was bought and is now Stina. Their wines are of good quality but highly extracted as is often the style in Dalmatia.